Most people who know me, know I’m very good with people, but I don’t like interacting with people too often. I don’t know if it’s my abrasive nature or my anger issues, and personally, I don’t care. But it’s odd because I crave human contact after a while. I can’t go too long without interacting with people or I start to lose it a bit. Interaction with our fellow humans drive us. Some people are loners. I consider myself to be one, but no matter how isolated I try to make myself, I must admit there’s something about interacting with people. That feeling you get when someone understands your point of view. Or when you find out the random girl at the bookstore is a Naruto die-hard. Or that weird feeling you get when you see that one white guy from work you were 100% sure was a racist, at a Black Lives Matter rally screaming his lungs out for civil rights. It feels good to talk to these people, to hear their hopes, their dreams. Those feelings fuel us as humans, make us feel alive, even in our darkest moments. I’m no doctor, or even an expert on this, but I know what I’ve felt whenever I’ve truly had a connection with someone. I know what it feels like to love someone. As a girlfriend, as a friend, and just as a person. It will drive you to do some crazy things. Make you say crazy things. But there’s nothing more invigorating than loving someone. Loving someone can come in many forms, but I’m a believer that we fall in love all the time. As I’ve gotten older, my definition of love has widened so far to the point that I love pretty much everyone. Which is ironic because I hate a bunch of people too. People who are racist, sexist, misogynistic, and just all around bad people get no love from me. I’ll never care for them because to me, being a good human is simple. On the opposite side, the people who I care deeply for in my life have a friend for life. Not even just them. I care deeply for people who I’ve met who are genuine, good people but I don’t talk to that much. My love for them extends beyond Earth because we need more people who just like human interaction. Doesn’t matter what kind to these people. They just like everyone. Usually, these people might be called weird or socially awkward. They talk too much sometimes and don’t know when to shut up. I’ve dealt with bullies my whole life who try to silence these people. High school, college, work, sports, it doesn’t matter. The bullies of our world prey on good people. I love these people so much, I’ll fight for them. Will stick up for them no matter the circumstance because our world is numb to bullies. People need to feel empowered to be who they are. All of those interactions, whether a kiss from a girl, or some random person on Twitter calling you a sperm dumpster, make us human. Some may argue that social media brings out the worst in humans, and I get that point of view. But social media might be the main reason you found my site. It’s how I’ve made good friends. It allows me to connect with people. Despite the positives, it does open a lane for bullies and Neanderthals to flood your timeline. While human nature tends to drive me insane, to the point I can’t sleep, I wouldn’t give it up for anything. 1000 negatives can be destroyed by one positive. It’s a beautiful thing to have the right to interact with others. It’s something I will fight for until I die. I couldn’t imagine having this reality stripped from me. Think about that for a second. Could you seriously imagine never being able to relate another human being ever again? Nothing you say is heard. Your feelings, your thoughts, your emotions, all invalid because people don’t see you as human. This is the reason civil rights and social justice is such a big deal in our society today. A lot of things such as systematic racism of blacks, the discrimination of gays, how men talk and act towards women, Islamophobia, and much more all dehumanize people based on who they are. That’s wrong, but the first defense someone makes when you accuse them of dehumanizing someone is the classic, “of course their human,” defense. This doesn’t solve anything. It just sends the conversation into left field. My point is, that even though social injustices happen all over the world that dehumanize people, we ALL know these people are human. Yes, religious zealots think that gays aren’t “human,” but science tells them their idiots. What would you do if your humanity was literally stripped from you? One second, you work as an engineer for a big company. Life is good. You have two kids and a social life that’s thriving. Imagine becoming something your friends and family don’t recognize. Imagine them rejecting you because they don’t understand what you’ve become. No human contact ever. No human can understand your hopes, dreams, and desires. This is a dark reality that would drive me to suicide. This isn’t something I’d wish on anyone because the pain of not having human interaction can kill. No one deserves this life. But Air Force Captain Nathaniel Adam goes through it every day as the nuclear-powered superhero Captain Atom. WHO THE HELL IS CAPTAIN ATOM? For those who don’t know. Doctor Manhattan is a character from the famous graphic novel, Watchmen, written by Alan Moore. If you haven’t read the story, please do so, but it’s one of the greatest stories of all time. Manhattan was inspired by Captain Atom. He was the first hero to have this type of nuclear based power. Their emotions, powers, and appearance are similar, but Manhattan is completely disconnected from humanity. He’s a more somber version of Captain Atom. 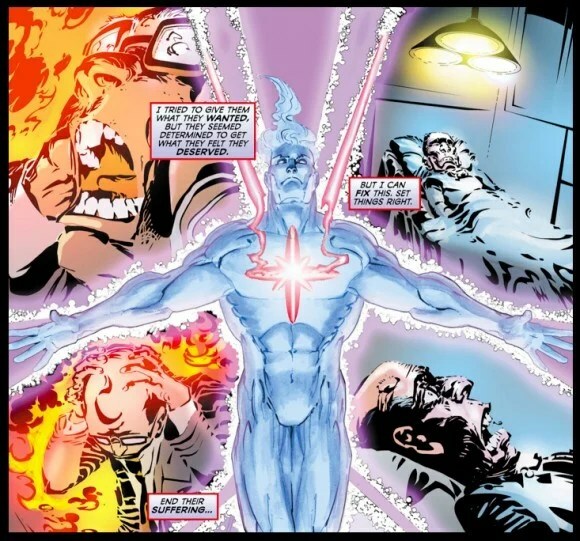 One of the coolest things about Captain Atom is his powers. They have changed over the years, but one thing is certain. He’s one of the most powerful people in the DC Universe. Captain Atom’s powers are mainly nuclear. He is tied to something known as the Quantum Field. He is a living, breathing piece of energy. Atom absorbs energy, can redirect it, and can create it as well. Obviously, this is a dangerous type of power to have. Captain Atom’s powers can get out of control sometimes. His atoms are constantly splitting and reforming. If they don’t reform, he can die. Atom can also travel through time, but not of his own free will. His powers overload themselves sometimes and Atom is sent through the time stream. His New 52 run saw him do some amazing things. He turned lava into snow when trying to save the people of New York. A military commander, General Eiling, tries to convert Atom into a weapon. When Atom refused, he sent fighter jets to kill him. Our nuclear hero transformed the jets into feathers. The coolest thing he did in his N52 run though was save a young boy from cancer. He shrunk to subatomic levels to personally destroy the cancer cells in the boy’s body. It was a beautiful moment because while not “human” anymore, Atom craves that feeling again. Doctor Manhattan is full of nothing but melancholy. His disconnect from humanity is frustrating sometimes because of the good he can do. He tries to do good, but he just doesn’t care about humanity by the end of Watchmen. Captain Atom does though. All he wants is to feel the touch of a woman again. His powers distinctly allow him to remember the first and last time a girl touched him. A big reason Atom feels so disconnected is because of the way people treat him too. This would be the DCEU’s chance to get their alien approach right. The main reason the DCEU needs Captain Atom is because of their failed attempt at Superman being an alien. And they didn’t necessarily fail, it just wasn’t believable given the other aspects of the story. Man of Steel tried to hammer his alien status home but there’s a huge flaw in Superman’s lack of human identity. Superman has extraordinary powers. Heat vision, superhuman strength, flight, and many more. But, as far as we know, Superman is normal. He uses the bathroom like us. He dreams like us. Superman even looks like us. If he wanted to, he could blend in for the rest of his life. He’d never be bothered. Just another white guy working in a big city. Even when he’s not saving the world, he’s Clark Kent. He blends in and hides from the world for his own reasons. I respect those reasons, but his anger towards humanity isn’t quite believable when it comes to the DCEU films. Not to mention it isn’t in the character of Superman to loathe humanity just because they distrust him. Batman v. Superman put Clark through a weird journey. Not only did they insult his intelligence by having him believe Lex’s nonsense, but he almost broke because people were saying bad things about him. Seriously Superman? I’ve said it a billion times. A billion times, but I’ll say again. Great concept, poor execution. Captain Atom can’t hide who he is. His powers are tied to the Quantum Field. There isn’t anything human about him. The DCEU needs to find a different approach to their alien storyline. Superman is an obvious choice because of his origin and his status. But Captain Atom provides a chance to step back and reexamine human interaction. A chance to examine how they hurt us, how they help us, and why we crave them so much. The DCEU needs a hero who doesn’t feel like a hero at all. Someone who is foreign to their universe and ours. Captain Atom isn’t popular in our culture. A film done right with him can expand on human nature. Something Man of Steel and Batman v. Superman tried to do, but while trying to do many other things at the same time. IF you read my Batman Beyond piece, you know that one of the main reasons he needs to be in the DCEU is because of the possibility of the effects and visuals. Captain Atom is the same, but times fifty. The visuals in a Captain Atom film could be something everyone would be talking about. It was one of the coolest things about Doctor Strange. 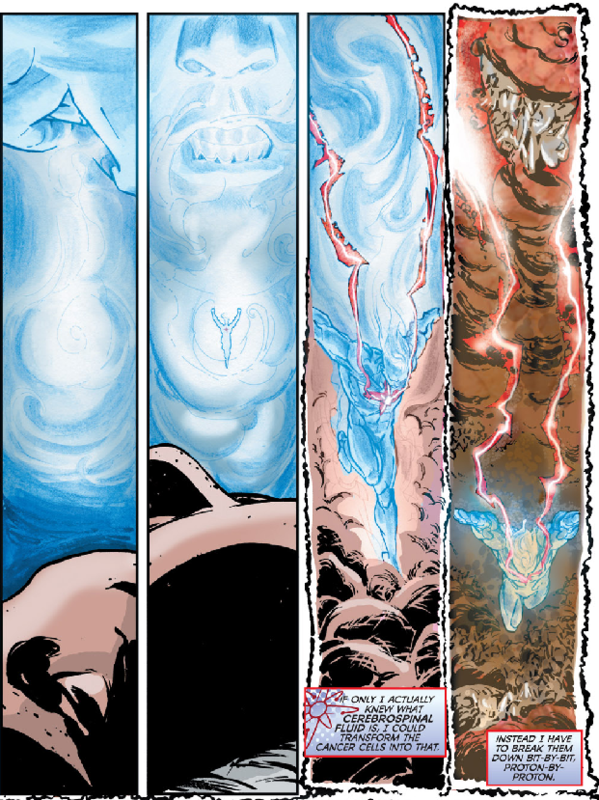 And let’s not forget how great Doctor Manhattan looked and that was in 2008. A Captain Atom film could do groundbreaking things when it comes to special effects. His looks, his powers, how he flies, his facial expressions, everything. This could be groundbreaking because Freddie Williams’ II art during the New 52 run was. He brought Nathaniel Adam to life. With focus on themes of humanity and fear, combined with cutting edge special effects, a Captain Atom film would be one of the best DC films of all time. So, how does he fit into the DCEU? Certain characters like Nightwing can be thrown in the mix immediately. Batman Beyond needs to wait a few years so the Bat-family can get established. 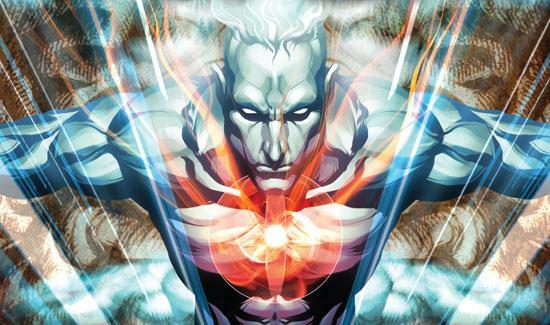 Because of his unique powers and story, Captain Atom could have a film immediately. The current version of Captain Atom isn’t trusted by the Justice League. They consider him to be a walking bomb. They’re ignorant about his abilities just like the rest of the world is. 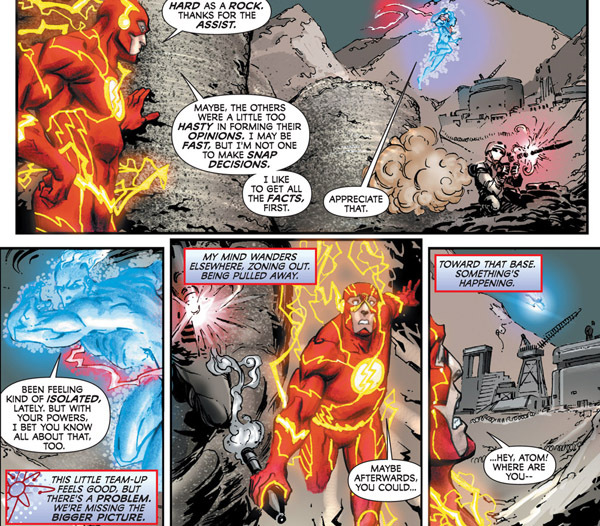 Captain Atom recently met Flash when in Libya. Both heroes were trying to assist the citizens fight against their corrupt government. Flash didn’t know what to think of Captain Atom at first. He questioned his motives sure, but Atom assured Flash he was only trying to help. They had a cool moment before Atom’s senses led him to a nuclear bomb that was primed to go off. Instantly, Atom left Flash to absorb the impact from the bomb. The sheer force was enough to decimate the city, if not the country. Captain Atom acted quickly and ended up saving everyone. Except everyone thinks he’s the reason the bomb went off in the first place. This strained relationship with the Justice League has increased. His new series The Fall and Rise of Captain Atom takes place after his New 52 run. I won’t spoil anything about that run, but let’s just say, his relationship with the League hasn’t gotten better. This is the perfect recipe needed to throw him in the DCEU. Not everyone in the universe needs to be cool with the Justice League even though they are a hero. It’s nice to have an outsider who’s a wild card. When it comes to his personality and actions, Atom is calm as a cucumber. His powers make him unpredictable though. They’re always evolving and changing. Putting him in the DCEU could definitely shake things up. As stated earlier, this is there chance to really explore the alien themes they tried to with Superman and will continue to try with Wonder Woman when her film comes out later this year. As I think about actors who could play Captain Atom, I get excited because of the transformation he goes through mentally, a certain type of actor is needed. No, we don’t need some unknown actor who has potential, and we don’t need an eccentric method actor. The perfect actor to play Captain Atom should be someone who is usually a socialite in real life, or at least plays one in their films. Channing Tatum, Liam Hemsworth, Chris Pine, are some of the names that come to mind. Nathaniel Adam was full of life before the accident. At first, when he becomes Captain Atom, he’s mentally the same man, but over time, that changes. The actor tapped to play him must be willing to fully embrace the loneliness of the character. He doesn’t crack many jokes, but he isn’t a stiff board. He is full of empathy and emotion. I would love to see an actor full of life transform into the alien I love from the comics. It’d be an interesting project for any actor or director to take up. I want to touch on the importance of this type of character in the DCEU. Doctor Manhattan is one of the most popular characters in DC Comics history. He’s easily recognizable. 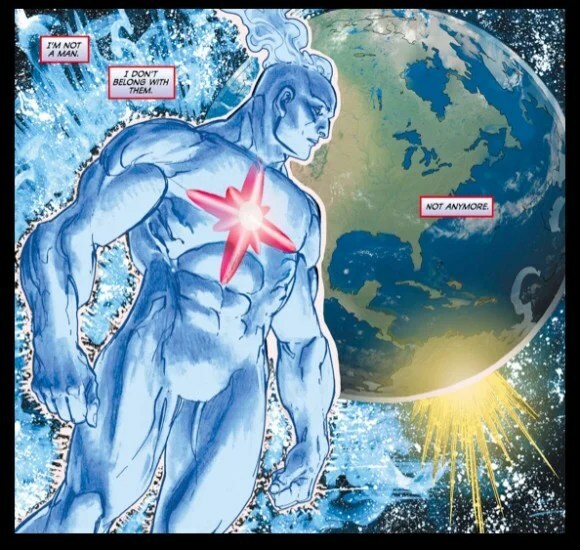 It’s a shame people still think of Captain Atom as Doctor Manhattan, but their differences are clear. The one word that separates them is hope. Hope is the cornerstone of DC Comics. The approach they’ve taken to the DCEU so far isn’t hopeful at all. They’ve dug themselves into a hole so deep that Justice League can come off as a parody of hope, and not hopeful at all. Jokes, upbeat music, and high-fives aren’t what hope is. Hope is keeping a smile on even in the face of the end. Believing that things will work themselves out. And when they don’t, maintaining a positive look on life because that’s all you can do. Captain Atom is MUCH more hopeful than Doctor Manhattan. Yes, by the end of his New 52 run, on the last page, he says the words, “I’m not a man. I don’t belong with them. Not anymore.” This is due to a bevy of reasons, not just his lack of hope. People refuse to accept Captain Atom. There’s a constant stereotype of him leaking radiation that he can’t beat. Pair that with the fact that his powers continue to discourage his hope to ever feel human again, and any man will reach his breaking point. Still, he’s giving it another go now. I’m excited to follow his journey in the comics and I encourage you to as well. The last point I want to make is about the tragedy of this character and the revelations he reveals about human nature. The DCEU has tried to make people’s reactions to Superman “real” but now he’s dead and people miss him. Why? Well, given what I said earlier, people can still somewhat relate to Superman. It’s weird, but even though he has all those powers, he still looks like a white man. White men are the most accepted type of individuals on the planet. Now, in the DCEU, people are more accepting of Superman. Even if they are scared of him, since Superman looks like them, they can fantasize about Superman being an everyday person. Fantasize about him going to work, having a wife, a son, all things that he actually can do. His sperm doesn’t kill women. His touch doesn’t burn his dearest friends. This fantasy can rest on the subconscious of normal citizens, and even if they don’t know it, they love Superman because of that fantasy. Throw the fact that he’s dead now, and we have a world trending topic on Twitter, with a vocal minority, and a silent majority who appreciate the Son of Krypton. Captain Atom is the transgender hero of the DC Universe. People don’t care what he used to be, or even what he considers himself to be. Inside his brain, he’s a man. He has all the thoughts of a man, the wants of a man, and anyone who talks to him realizes their error in judging him. But, people see an alien, so they assume he has alien thoughts of world conquest. There was a heartbreaking scene during his New 52 run. Towards the end of the run, Captain Atom creates people from his imagination. They aren’t real, but they believe they are. One person he creates is the mother of a scientist who hates him. He’s forced to remove the woman. They are in a room together. Captain Atom has to explain to her she isn’t real. It’s a concept she can’t grasp. To her, she’s a mother. She’s real. She asks Captain Atom why what she feels doesn’t matter to people. They don’t see her the way she sees herself but why does that matter? Shouldn’t how she see herself be the only thing that matters. My heart broke when Captain Atom responded somberly, “You would think so.” The woman, with tears in her eyes, evaporates into nothing. Captain Atom represents the tragedy of human nature. No matter he many times he saves them, there’s always something wrong. Someone always finds a way to hate him. A Captain Atom film in the DCEU can solidify the idea that humans, naturally, can’t accept something they don’t view as human. A sad reality. I would like to think we’d accept anyone in our society, but crimes still happen to humans who appear to be different from everyone else. I’m almost 100 percent confident we’d abhor Nathaniel Adam for what he looks like. Harsh realities make great stories. The DCEU needs an alien who can’t hide. They need Captain Atom.